I’ve written lots of posts about how important it is to know exactly what your monthly budget because, let’s face it, it’s difficult to know where to save money if you don’t know exactly where it’s been spent isn’t it? 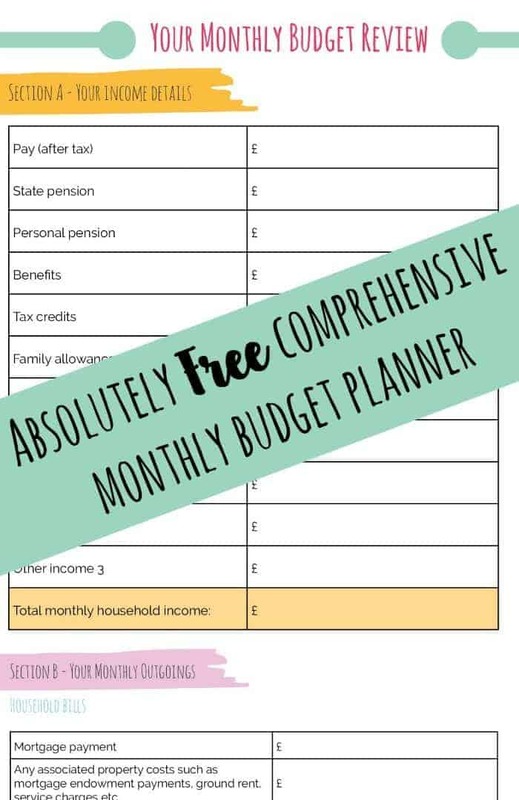 I first included a printable monthly budget planner on here not long after I started blogging and to this day, I can see that lots of you follow the link to my original version over on Google Docs every single day. The link for that is below if you’d prefer to print out the Google docs version but I’ve also made a prettier version which looks much better when you print it out and it’s definitely my preferred option when I re-do my monthly budget! Once you’ve decided which version of the monthly budget planner to use, print it out and take some time to complete it making sure that you don’t miss anything. It’s well worth sitting down with your last three months worth of bank statements to make sure that you get it all down in black and white. Don’t forget! If you miss things off then your monthly budget isn’t going to be accurate which could cause problems if you’re spending what you think you have available. Once you’ve completed the free monthly budget planner, have a look around the rest of the site for money saving tips!